N e w p o r t News Shipbuilding Co. reported recently that operating income increased 35 percent to $111 million from $82 million in 1981, the fourth year of higher operating income. The shipyard had sales of $1.3 billion, up 19 percent from 1981 sales of $1.1 billion. Including the December Navy contract of $3.1 billion for two Nimitz-class nuclear-powered aircraft carriers, the shipyard had a year-end backlog of $8.5 billion. The carrier contract is the largest contract ever awarded by the Navy. "We are pleased with our 1982 financial performance," said Edward Campbell, company president and chief executive officer. "Much of the credit goes to our employees, salaried and hourly paid, who have responded to the challenge of working smarter and increasing productivity." The shipyard delivered three Navy ships and launched two submarines in 1982. The Nimitzclass carrier Carl Vinson and the Los Angeles-class nuclear-powered submarines Atlanta and Houston joined the fleet from the Newport News yard. The Los Angeles-class submarines Buffalo and Salt Lake City were launched, and the yard worked on the Nimitz-class carrier Theodore Roosevelt and nine nuclear-powered submarines. Newport News Shipbuilding is a subsidiary of Tenneco Inc., a H o u s t o n - b a s e d conglomerate. Tenneco also announced this week that net income for 1982 and for the year's fourth quarter were up. Tenneco chairman and chief executive officer James Ketelsen said 1982 income from continuing operations was $840 million, up 5 percent from $798 million in 1981. Mr. Ketelsen called the increase "a commendable achievement in a tough year." 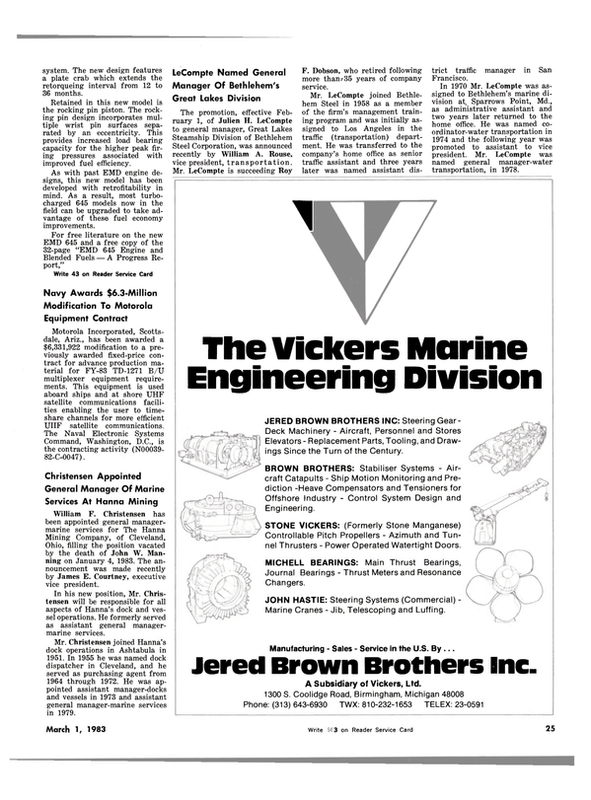 Tenneco sales and operating revenues in 1982 were $15 billion, about the same as in 1981. In the fourth quarter of 1982, income from continuing operations was $278 million, up 9 percent from 1981.